This is a die-cut flange Red Seal Dry Battery porcelain sign. 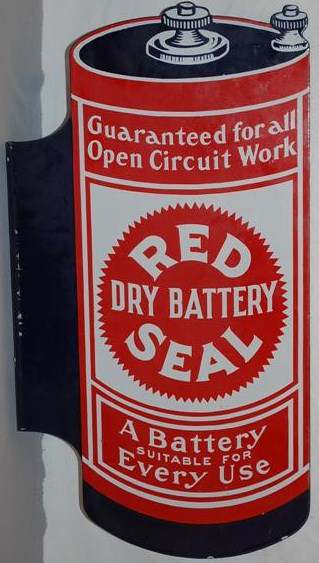 This particular Red Seal Dry Battery sign is predominantly red and white and shaped like a Red Seal Dry Battery. It reads, “Red Seal Dry Battery, Guaranteed For All Open Circuit Work, A Battery Suitable For Every Use”.